1. Quest reminder not displaying upon character leveling up has been fixed. 2. Archer arrow attack is not impacted by armor. 3. Paladin - Barrier: Holy Damage attribute improvements made. 4. An error with the adventure journal UI has been fixed. -Schwarze Reiter: Caracole, Retreat Shot, Concentrated Fire – Skill reuse time decreased. -Schwarze Reiter: Caracole – Knockdown removed. -Hunter: Growling – When feared, monsters will not run away and will not move when hit. -Resistances for archer family skills have been applied, see below. --Heavy Shot – 50% increased damage against plate armor. --Full Draw – 50% increased damage against leather armor. --Twin Arrow – 50% increased damage against cloth armor. --Stone Shot – 50% increased damage against plate armor. --Time Bomb Arrow – 50% increased damage against plate armor. --Bodkin Point – 50% increased Damage against leather armor. -파이어필라사용시 몬스터가 파이어 필라 범위 위로 올라가지 않도록 변경되었습니다. -파이어필라에 피격되는 보스몬스터가 스킬을 사용하지 않던 문제가 수정되었습니다. -Bokor: Samedieveve – Caster now receives 50% of the benefits of this buff. -Oracle: Prophecy – Skill range increased by 50%. -Priest: Exorcise – Now applies to flying type monsters. -Paladin: Barrier – Skill ups now increase the amount of magic defense given. -Oracle: Arcane Energy – Stamina increase changed, total buff time increased to 30 minutes. 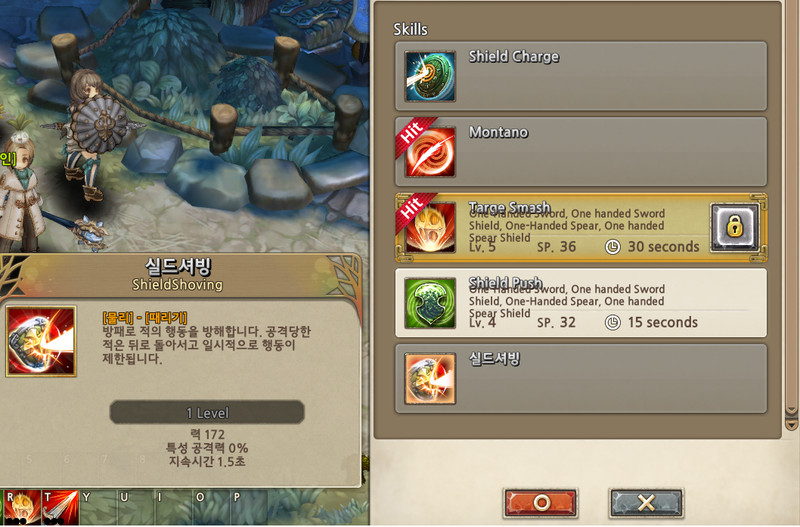 -Paladin: Conversion - Increase strength attribute renamed in Korean client to “Strengthen Force”. -Sadhu: Bashita Siddi – Strength of this skill has been increased. -Sadhu: Posession – Strength of this skill has been increased. -Druid: Transform – Fixed an issue where you would be unable to move after using this skill. -Dio, Thresh, Sestas, Drat, and Aston sets. 3. Some of the issues with the inventory UI being slow have been fixed. 4. Gem reinforcement with Talt items has been increased. 5. Made sure the amount of armor applied by enhanced armor matches the tooltip. 6. Fixed a consumption issue with Veiheider’s Hoglan food. 8. Ginklas boss will no longer use invincible skill. 9. Fixed a problem with sound effect adjusting. -Rodelero: Montano – Knockdown distance decreased. -Rodelero: Targe Smash, Evasion Movement, Montano, Shooting Star – Skill cooldown time reduced. -Archer: Kneeling Shot – Fixed an attack speed issue when attacking diagonally. -Scout: Undistance – Fixed an issue with charge gauge/SP while moving under this effect. -Hunter: Praise - Movement speed attribute giving correct values now. -Wugushi: Jincan Gu – Fixed shot applying DoT damage. -Wugushi: Detoxify – Skill range increased. -Necromancer: Gather Corpse – Knockback removed. -Pardoner: Oblation - Offerings: Specialied in Indulgentia ability성의 공격력이 봉헌 최대 매입 개수보다 초과되던 현상이 수정되었습니다. -Chest and pants physical defense reduced. -Chest and pants have increased physical defense. -Maximum HP option added to gloves and shoes. -Accuracy and evasion on shoes and gloves reduced. -Level 3: Increased SP by 10. -Level 4+: Increased Magic Defense, 2 initally, and +1 per level. -Level 4: 50% increased evasion. -Level 3: 34HP per level after this point. -Level 4: +1 STA per level at this point. 3. When using a companion, companion UI should now show up. 4. Fixed an issue where stamina was not depleting while running. 5. Fixed a glitch where using Alt + 2 would not trigger companion feed cooldown. 6. One BGM has been changed. 7. Crafting UI for materials changed slightly. Credit to Zazabar for the translation. Translations with KR font present may need double checking.